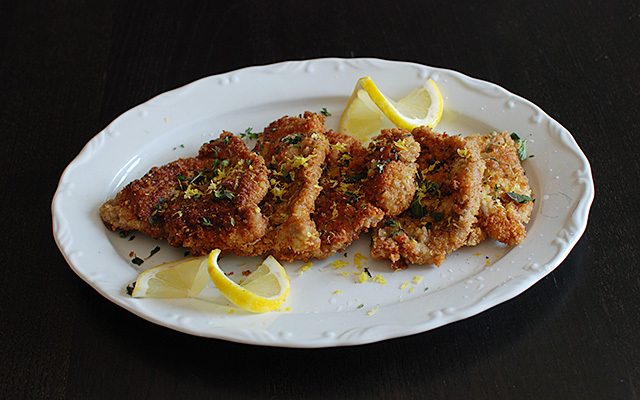 This is my take on Giada’s Pork Milanese (breaded porkchops with Parmesan cheese). I had stale bread which I decided to use to make breadcrumbs. I just toasted the bread in the oven for a few minutes and pulsed it in my food processor until it resembled coarse breadcrumbs. Of course, if you don’t have stale bread, simply use panko breadcrumbs. 1. Mix panko breadcrumbs with Parmigiano-Reggiano cheese and Asiago cheese in a large shallow bowl. 2. Pour flour in another large shallow bowl. 3. Beat eggs in a third large shallow bowl. Season with salt and pepper. 4. Dip each porkchop first in flour, then in egg, then in breadcrumb-cheese mixture. 5. Melt butter in skillet over medium-high heat. Add olive oil. 6. Cook porkchops in butter/vegetable oil mixture until golden brown. 7. Place porckchops on a paper towel to drain. 8. Sprinkle the porkchops with lemon zest and chopped fresh parsley before serving. Now, my family is multicultural and this dish is perfect in satisfying everybody’s palate. The way I served it, I call the meeting of three cultures. The dish is Italian and I served it two ways – in a sandwich (American-style) for Troy and with steamed rice and roasted vegetables (Asian-style) for the rest of the family.